I mean, COME ON! These little buggers look deliscious….but unfortunately, the Bon Appetit recipe I used left out a couple of critical steps. Well I’m coming to the rescue so we can all, once again, appreciate an airy ball of yumminess, mixed with cheese. We’re going to start with a choux pastry….very similar to the profiteroles. In fact, when I went back to that recipe, I realized the Bon Appetit instructions were incomplete. Should have stuck with my girl, Ina. 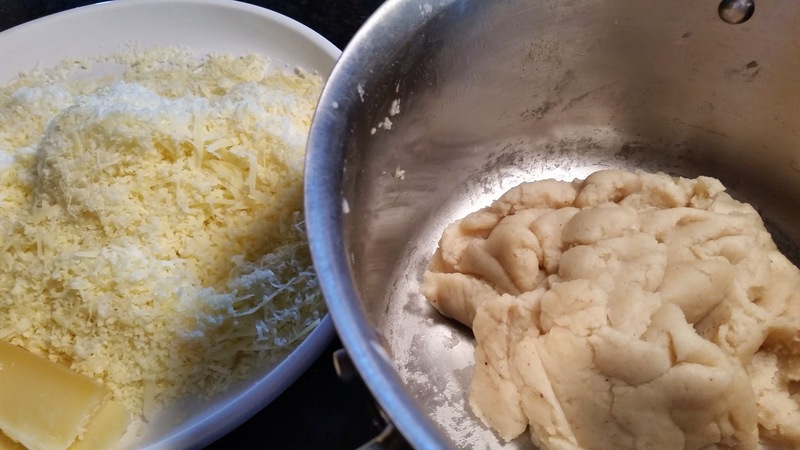 So far, this is just pastry and it looks boring but then comes the cheese, and a lot of it! So, friends, here’s where things go wrong. The instructions say to remove the pastry from the heat as soon as a film begins to form, on the bottom of the pan. Ok, so far so good. It then says to take the pastry off the heat and add each egg, one at a time, “until fully incorporated”. Good luck with doing this by hand. I’ll just sit back and enjoy a glass of wine, while you attempt to incorporate one egg, never mind four. You must do this in a food processor, for several reasons. A.) it helps remove moisture and B.) it actually “incorporates” the eggs! Go figure. Those pesky pastry bags have gone missing again so I used a large zip lock bag to pipe the batter onto parchment paper, after snipping a 1/2 inch off the corner. Next time I’ll try to go a little smaller as these were 2-bites size. * Double the salt! When mine were done, they needed more so I melted some butter and salt, and brushed it on. * Let them cool in the oven, with the heat off and door cracked, for about 20 minutes. Now you’re armed and ready to make some delicious gougeres!! Preheat oven to 400°. Bring butter, salt, nutmeg, and 1 cup water to a boil in a medium saucepan, stirring until butter is melted. Remove from heat, add flour, and stir to combine. Cook mixture over medium heat, stirring vigorously with a wooden spoon, until mixture pulls away from sides of pan and forms a ball, about 2 minutes. 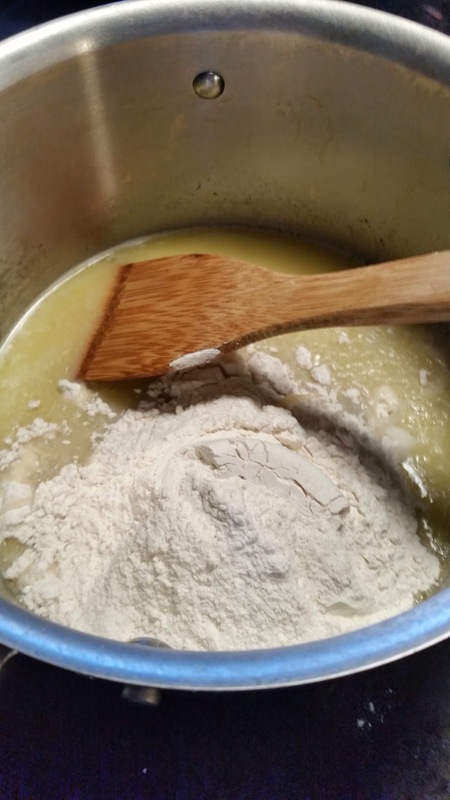 Continue to cook, stirring vigorously, until a dry film forms on bottom and sides of pan and dough is no longer sticky, about 2 minutes longer. Remove pan from heat and let dough cool slightly, about 2 minutes. Mix in whole eggs one at a time, incorporating fully between additions. Mix in cheese and pepper. Scrape dough into a piping bag fitted with a ½” round tip (alternatively, use a plastic bag with a ½” opening cut diagonally from 1 corner). Pipe 1” rounds about 2” apart onto 2 parchment-lined baking sheets. Whisk egg yolk and 1 tsp. 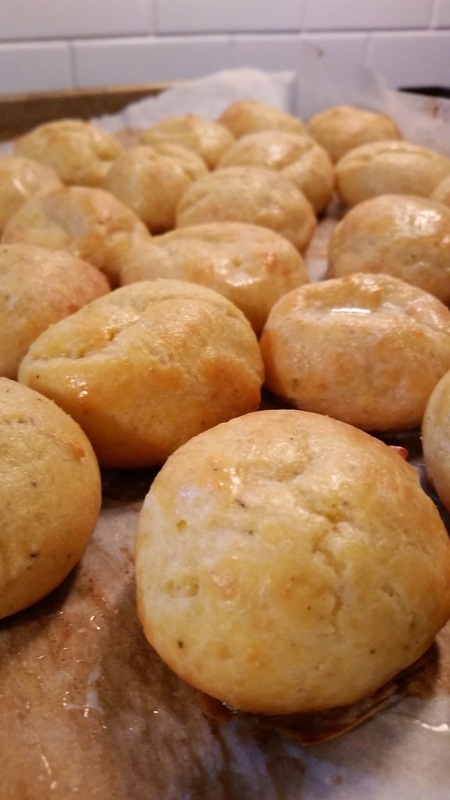 water in a small bowl; brush rounds with egg wash.
Bake gougères until puffed and golden and dry in the center (they should sound hollow when tapped), 20–25 minutes. DO AHEAD: Dough can be made 4 hours ahead. Cover and chill. 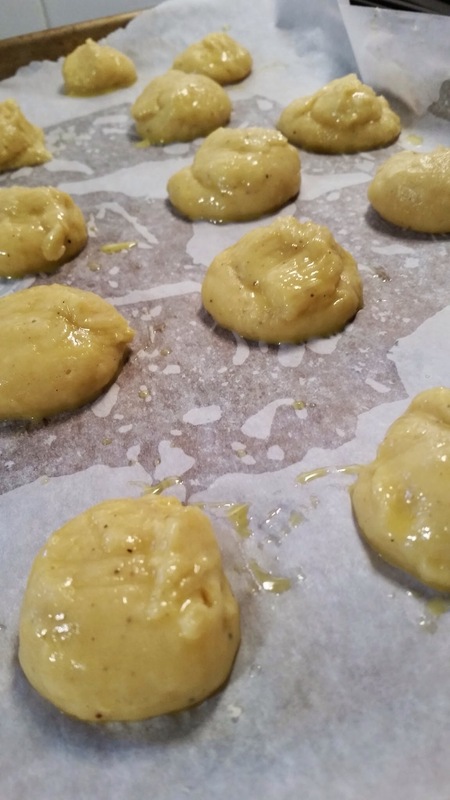 Gougères can be baked 2 hours ahead; reheat before serving.